Zany and zippy as you’d expect, “The SpongeBob Movie: Sponge Out of Water” remains true to the surrealism of its animated television roots. But it also tries to force a live-action element which isn’t as comfortable a fit as a certain pair of symmetrical trousers. The comedy from director Paul Tibbitt (a longtime writer and executive producer on the series) and Mike Mitchell (who helmed the live-action segments) doesn’t necessarily further the characters or their story or provide any depth. It just offers a good time for a longer time. Trouble is, it feels like Tibbitt and Mitchell have made two totally separate films and then slammed them together, with shifts in visuals and tone which feel rather jarring. Mind you, I’m looking at this from the perspective of a grown woman who’s reviewed films for a living for the past 16 years. Your kids won’t be nearly so analytical/uptight/whatever you want to call it. They’ll have a blast. I brought my 5-year-old son and one of his little school buddies to a recent screening and they were literally jumping up and down, dancing and giggling their heads off. In theory, this is all that matters. But “SpongeBob” often also works on a much more adult level with subversive humor and pop-culture references that surely will go over your young ones’ heads. The basic premise isn’t all that complicated. The absorbent, yellow and porous SpongeBob (voiced as always with an infectious enthusiasm by Tom Kenny) enjoys his simple life in the underwater village of Bikini Bottom. He works as a fry cook at the fast food joint The Krusty Krab, spars with the bitter Squidward (Rodger Bumpass) and hangs with his best friend, the dimwitted starfish Patrick (Bill Fagerbakke). Everything is great. But then one day, the magical secret formula for the Krabby Patty—the addictive fast-food treat the whole town adores—goes missing, plunging the pleasant Bikini Bottom into instant apocalypse. The speed and the detail with which this deterioration occurs provide huge laughs and are a great indication of what this series has always done best. Mr. Krabs (Clancy Brown) initially suspects Plankton (Mr. Lawrence) of the rival restaurant the Chum Bucket is the culprit. But the eternally sunny SpongeBob suspects otherwise, and teams up with the cranky Plankton to track down the real thief: the villainous pirate Burger Beard (Antonio Banderas), who pops up sporadically in live-action segments explaining the story to a group of talking seagulls. And it’s the back-and-forth of the framing device that’s a problem. While Banderas has proven he’s a master of making fun of his own macho image through the Puss in Boots character—and he’s certainly giving it his all in the name of campy fun here—these portions of the film just aren’t as funny as the animated ones and they slow down the pace. Eventually, the animated characters must emerge from the deep to fight for junk-food justice on dry land. (Essentially, they turn into an even goofier version of the rag-tag band of crime fighters from “Big Hero 6.”) The film’s subtitle may be “Sponge Out of Water,” but not until the third act do the cartoon and live action portions collide. 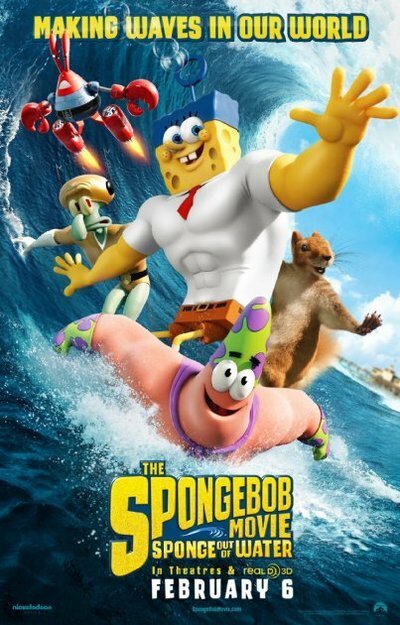 The 3-D, CGI imagery does provide a different perspective on the characters and their textures, but this big conclusion feels like a rather generic action sequence, especially compared with the innovation of the animated SpongeBob universe. Somewhere in here, amid the mania over the loss of the Krabby Patty, there’s probably some sort of message about the dangers of consumerism and the numbing effect of ubiquitous pop-culture phenomena. I couldn’t really think straight over the noise of my kid screaming joyfully every time he saw a “SpongeBob Movie” billboard or poster on the drive home.